Hemangioma Liver Tumor is by far the most common benign tumor discovered in general population. Usually it is found unintentionally during abdominal ultrasound or CT scan/MRI examination performed for other indications. The tumor is found in both men and women, but female to male ratio is 3:1. Hemangiomas are considered to be vascular malformations, they are probably congenital in origin and have no potential to become cancer. In around 40% of patients multiple hemangiomas are found. They can occur in either right or left lobe of the liver. The majority of hemangiomas found in adults are small (less than 5cm), but they could grow and reach giant proportions. Even very large tumors tend not to cause any symptoms, unless they become extremely large and compress surrounding structures such as stomach or duodenum producing vague abdominal pain, nausea or vomiting. Occasionally (extremely rare) there could be thrombosis of the tumor blood vessels or bleeding inside the tumor causing increased abdominal pain, abnormal liver function tests and fever. This episode usually lasts few weeks with improvement until next episode occurs. The diagnosis is made on MRI or CT scan imaging that show very typical appearance of these tumors. Biopsy is generally not recommended due to high risk of bleeding. Generally these hemangiomas tumors are managed by observation and repeat imaging. The indications for surgery of these tumors are complications such as rupture with bleeding ( rare but has 60% mortality), rapid change in size, persistent abdominal pain without other sources, nausea and vomiting due to compresion effect and development of Kasabach-Merrit phenomenon. Kasabach-Merritt phenomenon is characterized by profound thrombocytopenia (low platelet count), microangiopathic hemolytic anemia, a consumptive coagulopathy, and presence of vascular lesion such as hemangioma. The other types of treatment are arterial embolization, steroid therapy, interferon and local radiation. Surgical resection remains the most secure and curative approach to hepatic hemangiomas that meet indications for treatment. 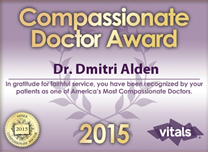 For more information pertaining to Benign Liver Tumors Surgery or for a consultation with the liver surgeon pertaining to your benign liver tumor surgery for hemangioma, hepatic adenoma, or focal nodular hyperplasia (FNH), please feel free to contact the NYC Liver, Pancreatic & Bile Duct Oncological Surgeon, Dmitri Alden, MD, FACS, today by phoning his New York office (212) 434-6216 or using the eForm on the right.